The hottest – "Sizzling Hot™ pro5"! More game fun with new sound concept and design! 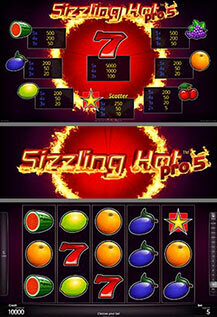 This 5-line (fixed), 5-reel video game is the latest version of the famous gaming classic "Sizzling Hot™". All wins are for combinations of a kind and are paid for combinations left to right on lines (fixed), except scatter STAR. Scatter symbols pay at any position. Scatter wins are added to line wins.